So if "the risk concentration at AIGFP was neither a secret nor a surprise" - and if Gillian Tett should have known all about it, what's AIG's excuse for not understanding the risk they held? Their excuse seems to be that it was all Joe Cassano's fault. I doubt we'll ever truly know the real reason. My sense, from talking to people in a better position to know than me, is that it was a combination of AIGFP: (1) not understanding or particularly caring about the declining underwriting standards in the subprime market (a mortgage was a mortgage to them); (2) not fully understanding how the (somewhat new) collateral posting process on these trades worked; and (3) old-fashioned excessive optimism. The mistake that the people who knew about the risk concentration at AIGFP (myself included) made was assuming that AIG was a modestly sophisticated financial institution, with a non-dysfunctional risk management system. It turns out they lacked both sophistication and a functional risk management system. Could we have known about this in advance? I've never looked into it, but my guess is that we could've at least known about the problems with their risk management. I highly doubt that any institution could've known about the collateral posting requirements on all AIGFP's trades with other counterparties though. Even by having lots of discussion on AIGFP, we will never get the real reason from it. The Gene Park story makes sense to me. Would love to see a comment on Alan Grayson's latest camera time at Barney Frank's hearing. I guess that is what you're saying in your comment. We knew they had exposure, but assumed they were properly managing it. Even with that said, it still seems the stock price should have been hit from this exposure before the start of 2008. I think you miss Tett's point that the really worrisome questions are: Who is selling CDS now that AIG is out of the picture and do the Central Banks have the data they need to monitor the situation? If the risk held at AIGFP was indeed not a surprise to anyone trading in the CDS market, then can we assume that AIG's counterparties deliberately caused a systemic collapse of the CDS market? 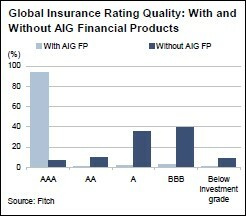 Re: AIG's Price - It actually did not "hold up well." I know this because I was shorting it. I don't know when in July 07 this report came out - but the early July price for AIG was about $70/sh. The late July price was about $64/sh. It did bounce around either side of $65/sh. until late October and then it went on to sniff the lower 50s before settling around $58/sh. for the year. Using the end July price, it was dropping at about a 20%/yr. pace. Using the early July price, it was dropping at about a 30%/yr. pace. Pretty tame compared to what was to come, but far from holding up well. Before the reverse split, the float for AIG was about 2.5 bln shares - so it takes awhile to move a stock like that. Also, the report was "out" - but possibly not widely read or discussed. I don't think Maria Bartiromo or Larry Kudlow spent a lot of time talking about this - assuming they were even aware of its existence. Whole body theDiablo 3 Items those who believed with regards to the possibility concentration at AIGFP (personally included) produced was in the event that AIG became a modestly superior loan company, using a non-dysfunctional chance administration technique. It turns out they was lacking both equally complexity plusBillig WoW Gold a purposeful chance supervision technique.